Eater put together a map of New York’s “strange sandwiches” yesterday and (naturally) our very own Cer Te (on 55th btw. 5+6th) made the cut. They had so many “bonkers” options to choose from, but went with the Mr. 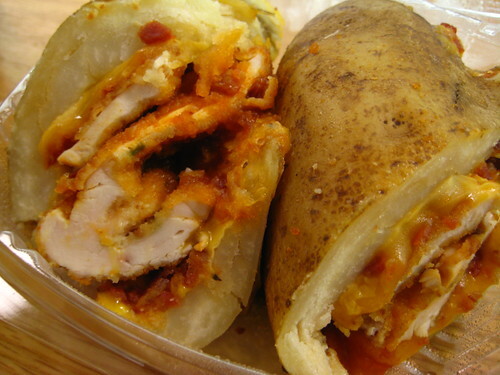 Potato Skin, a special from back in April featuring fried chicken sandwiched inside a baked potato. In other strange sandwich news, Robert Sietsema from the Village Voice hit up City Sandwich, the new Portuguese spot on 9th Ave that Chris got really excited about a few weeks ago. Sietsema’s favorite sandwich? The blood sausage with broccoli rabe. Nice. Posted by Zach Brooks at 2:00 pm, October 27th, 2010 under Sandwiches. Ack. Too bad I haven’t eaten any of those sandwiches before. Using a baked potato as the bread component sounds pretty awesome. In lieu of chicken, a slab of meatloaf with gravy would make this irresistable to me.